Renowned WWE video game experience turns up the storytelling and fun factor, delivering its largest playable roster in franchise history; innovative gameplay additions and improvements; returning and updated fan-favorite modes; extensive creation options and more. WWE 2K19, the newest addition to the flagship WWE video game franchise, is now available worldwide to Early Access customers for the PlayStation 4, Xbox One family of devices including the Xbox One X and Windows PC. Delivering a unique mix of authenticity, storytelling and fun, WWE 2K19 showcases a massive roster of popular WWE, NXT and 205 Superstars, as well as WWE Legends and Hall of Famers, engaging WWE gameplay across a variety of match types and options, extensive creation capabilities, fan-favorite modes and much more. Developed collaboratively by Yuke’s and Visual Concepts, a 2K studio, WWE 2K19 is rated PEGI 16. WWE 2K19 is available now worldwide to Early Access customers for the PS4 system, Xbox One and Windows PC, with the standard worldwide on-sale for all three platforms beginning October 9, 2018. * Open to legal residents of the 50 United States & D.C. (excluding AZ, CT, MD, and ND), Australia, Belgium, Canada (excluding Quebec), France, Germany, Great Britain, Ireland, Mexico, Netherlands, New Zealand, Portugal, Singapore, Spain & Switzerland, who are at least 18 years of age and the age of majority in their state/country/province of residence. WWE 2K19 game and Internet connection are required. Game must be played on Xbox One or PlayStation 4. Void in AZ, CT, MD, ND, Quebec and where prohibited. Entry begins 12:00:01 AM Eastern Time on October 9, 2018 and ends at 11:59:59 PM Eastern Time on January 31, 2019. 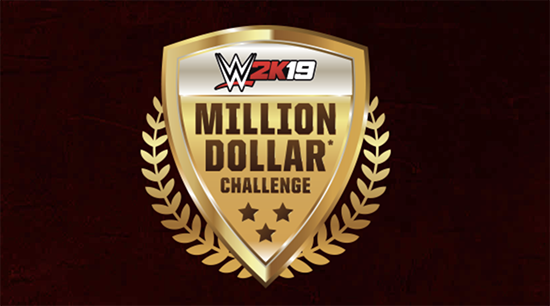 Subject to the Official Rules, which will be posted at wwe.2k.com/milliondollarchallenge/rules. Sponsored by 2K Games, Inc. (“2K”), a wholly owned subsidiary of Take-Two Interactive Software, Inc., 10 Hamilton Landing, Novato, CA 94949, USA. Grand Prize Tournament is expected to take place in NYC on or about April 7, 2019, result will be announced same day. THE ONE MILLION DOLLAR GRAND PRIZE (MINUS APPLICABLE TAXES) WILL ONLY BE AWARDED IF, AND ONLY IF, THE CONTEST WINNER BEATS AJ STYLES IN THE GRAND PRIZE TOURNAMENT IN ACCORDANCE WITH THE OFFICIAL RULES. ** PlayStation Network, Xbox Live or Steam account and Internet connection required. Copy of WWE 2K19 required to play.